On PAC’s Sept. 17 agenda was a recommendation to waive fees for any charity that distributes “goods for basic human needs” in Ann Arbor parks. It was brought forward by Christopher Taylor, a city councilmember and ex-officio member of PAC. Christopher Taylor, a Ward 3 Ann Arbor city councilmember who serves as an ex-officio member of the park advisory commission. The recommendation comes two months after the Ann Arbor city council waived all rental fees for the use of Liberty Plaza during a one-year trial period, based on a PAC recommendation. 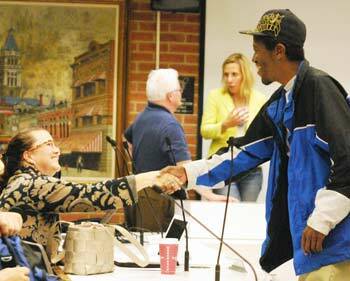 That city council action came at its July 15, 2013 meeting. That fee waiver was approved in response to a situation that arose earlier in the spring, when city staff considered applying fees to the hosting of Pizza in the Park in Liberty Plaza – a homelessness outreach ministry of a local church. Liberty Plaza is an urban park located at the southwest corner of Liberty and Divisions streets in downtown Ann Arbor. The Liberty Plaza fee waiver applies to all activities – social, cultural, and recreational – with the goal of increasing the use of that urban park. However, members of Camp Take Notice, a self-governed homelessness community, have lobbied for a written commitment that the city would allow humanitarian efforts to take place on public land generally, not just at Liberty Plaza. They’ve objected to the focus by the council and the park advisory commission on general activities – as opposed to the protection of humanitarian aid efforts. The proposal considered by PAC on Sept. 17 would amend Chapter 39, Section 3:6 of the city code. [.pdf of revised ordinance language] It would be a permanent fee waiver for this specific purpose – the charitable distribution of goods for basic human needs – but it would still require that organizations get a permit to use the park, and follow permitting procedures, including clean up obligations. Several supporters of Camp Take Notice attended the Sept. 17 meeting, but did not address the commission before the vote. In introducing the resolution, Taylor recalled the history of the Liberty Plaza fee waiver, and of the Camp Take Notice advocacy for a broader waiver. He noted that the waiver doesn’t alter the authorized uses of the parks, or alter the permitting process. The wording “charitable distribution of goods for basic human needs” was arrived at in consultation with city parks staff, the city attorney’s office, and Camp Take Notice representatives, he said. Colin Smith, the city’s parks and recreation manager, noted that because it would amend an existing ordinance, the resolution would require initial approval at a first reading at city council, followed by a public hearing and final reading at a subsequent council meeting. Taylor indicated that he would bring this resolution to the city council at its Oct. 21 meeting for a first reading, followed by a public hearing and final reading at a subsequent meeting. Tim Berla noted that someone will have to decide whether a particular application for this waiver is acceptable or not. “It seems like a good definition,” he said, “but this is Ann Arbor, so it seems like also somebody will come up with something that is borderline.” There might be waivers requested for things that aren’t universally recognized as a community benefit, he said. 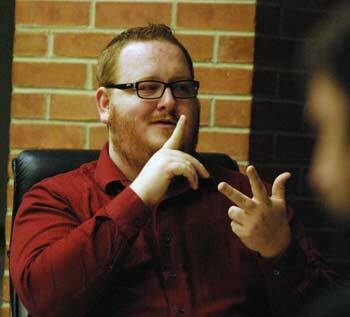 At the request of a resident, the city hired Matthew Butler to provide sign language interpretation during PAC’s Sept. 17 meeting. Parks and recreation manager Colin Smith replied that he was comfortable with the proposed language. There’s room for interpretation on a lot of things handled by the parks staff, Smith noted. For example, activities are supposed to relate to the parks mission, which is open to interpretation. As with other things, the waiver will be looked at on a case-by-case basis, Smith said, adding that by going through the regular permitting process, there are opportunities for checks and balances. Bob Galardi wondered if there is an appeals process, if the city rejects an application for a waiver. It varies, Smith replied. In this case, it would likely be appealed to the city administrator. Alan Jackson described the phrase “basic human needs” as a “very fuzzy term.” Food and water comes to mind, he said, but does it extend to shelter or medical care? Is the park an appropriate place for that kind of thing? How broad does this waiver become, and what are the limitations? he asked. Taylor replied that the word “goods” was specific, and therefore medical services wouldn’t apply. Jackson countered that pharmaceuticals are “goods.” Taylor felt that it would be outside the scope of the waiver. Outcome: The fee waiver passed unanimously on a voice vote. At the end of the meeting during the agenda slot for public commentary, Alonzo Young told commissioners he was on the board of Camp Take Notice and he wanted to thank them for passing the resolution about the fee waiver. PAC chair Julie Grand told him he’d given the most positive public commentary she’d ever heard, and she thanked him for his remarks. Ginny Trocchio, who provides staff support for PAC’s land acquisition activities as well as for the city’s greenbelt program, presented an annual report at the Sept. 17 meeting. 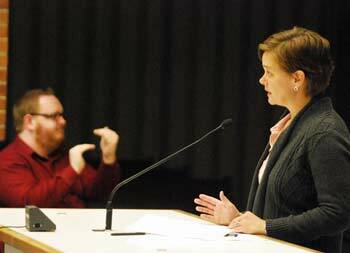 In the background is sign language interpreter Matthew Butler. Karen Levin, an Ann Arbor park advisory commissioner. Trocchio also noted that she hopes to hold a joint session of the greenbelt and park advisory commissions sometime later this year. There was minimal discussion among commissioners. Julie Grand noted that the city has accomplished a lot of its initial goals for land acquisition, but there are still funds available for that purpose. There’s nothing to prevent PAC from looking at its priorities and potentially approaching landowners who might be interested in selling, she said. Tim Berla introduced a topic regarding the accessibility of raw data from surveys that the city conducts. Specifically, he noted that subcommittees for PAC had recently done two surveys – for dog parks, and downtown parks. In addition to producing .pdf files with the results, it would also be helpful to have the raw data available for anyone in the community who wants it, Berla said. For example, someone might want to compare the difference in attitudes toward dog parks by comparing responses of dog owners and non-dog owners. He had advocated for releasing the data, and referenced some email exchanges with others who had raised objections that he said he didn’t completely understand. So his question was whether the city would release the survey data in raw data form. From left: Park advisory commissioners Tim Berla and Alan Jackson. Colin Smith, parks & recreation manager, replied that he had sent an email to all PAC members in response to Berla’s query. The city’s IT staff had indicated that it would be possible to release the data, likely in the form of an Excel spreadsheet. There’s no way to lock the file to prevent someone from modifying it, Smith noted, so that’s an issue that PAC should discuss. There are several ways to handle the survey data, Smith said. Because the recent surveys used SurveyMonkey, it’s possible to run multiple reports and cross-tabulations, he said – for example, to look at responses for downtown residents between the ages of 25-44. Smith suggested that anyone who wanted a particular type of report could email a request to staff, who could then run the report and publish it on the PAC website. Berla thought that for the sake of transparency, there should be a way to release the data. He didn’t dispute that people might use the data in a manipulative way. “There’s no way you can give somebody a spreadsheet and prevent them from doing something nefarious,” Berla said. “The good thing is that everybody would have the data,” he added, so anybody could verify the information. The data is a public resource, Berla said. The point is to learn about how the community feels on these two issues. The advantage to releasing the data would be that it wouldn’t entail more work for staff, he noted. Berla said his main goal is for people to have access to the information. Graydon Krapohl asked what the city’s policy is on releasing data. He noted that the data collected by PAC’s subcommittees belongs to the city. That’s the bigger issue, he said, and it would apply to all city surveys. Smith said he didn’t have the answers to some of these questions. More tools have been available in recent years for getting feedback, including social media, and sometimes the policy doesn’t keep up, he noted. That’s something that city staff need to put more work into, he said. Smith pointed out that certain kinds of information – like emails and phone numbers from survey respondents – aren’t released. Missy Stults observed that the .pdf file posted on PAC’s website includes all the information from the surveys – not just a summary. She also wondered whether the city parks staff had capacity to handle a lot of requests for survey reports. Stults also suggested that PAC could encourage the city to come up with a policy on the issue of releasing survey data. A lot of people want the data and think that the city is holding it back, she noted, so it would be great if there were a standard policy to explain how the city operates in this regard. Alan Jackson said he didn’t really understand the reluctance to release data. Without the raw data, it’s not possible to do relational searches. There might be things that could be learned – nuances about the data – that members of the public could discover, he said. Doing the surveys has been a learning experience for PAC, he added. One of the key lessons is to understand what will be released at the end. Jackson didn’t see any reason to hold back the data available from the surveys. Mike Anglin, a Ward 5 city councilmember who serves as an ex-officio member of PAC, said that what the public pays for is public property. He suspected that the city would have a hard time telling people that they couldn’t have access to the data. Some local groups “are pretty sophisticated with data,” he said. 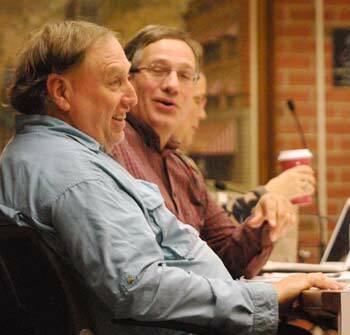 From left: Park advisory commissioners Graydon Krapohl and Bob Galardi. Anglin noted that the city ran into a similar situation with a survey regarding a convention center, saying that the survey’s open-ended responses weren’t included in a final report. “If you’re going to ask the public, then you should report back to the public on what you found,” Anglin said. Krapohl again urged the staff to develop a coherent city policy. It will only become more complicated as more people start using social media, he noted. If each commission decides how to handle it, then there will be a lot of inconsistencies, he said. The IT staff needs good guidance, and that has to come from a policy that should be reviewed by the city attorney and approved by the city council, he said. Stults supported releasing data, but agreed with Krapohl that a clear, standard policy is needed. Another challenge is that some people want the surveys to be statistically significant, she noted. That’s something that the staff and PAC don’t have the resources to do, so they need to be very clear about that. Julie Grand noted that because this is a very educated community, people should also understand the cost that would be involved in conducting a survey that’s statistically significant. The city tries to reach as many people as possible in its surveys, but it’s not possible to be representative of the entire city. The results are representative of the people who are willing to take the time to complete the survey, she said. It’s not realistic that the city would pay tens of thousands of dollars to do a survey that’s more sophisticated. The surveys that are done are one way to get feedback – but not the only way, Grand said. Jackson agreed that a survey is only part of the process. “Ultimately, our role is to provide judgment to council, who will make decisions,” he said. Certainly it’s important to solicit public opinion, he added, and that’s why PAC did these surveys. “But we don’t have to be a slave to some bizarre criteria that people come up with,” he said. Smith again stressed that all of the comments received from the dog park survey and the downtown park survey had been posted online [in .pdf form] – “hundreds and hundreds of pages of them.” He said he’d follow up with other city staff regarding the next steps to develop a policy on this issue. The Sept. 17 agenda included PAC’s annual election of officers. 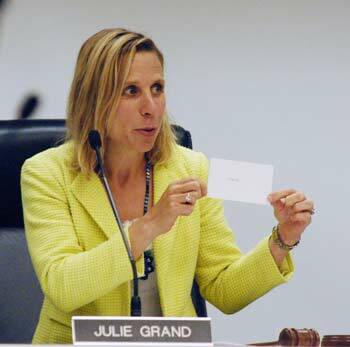 The current chair, Julie Grand, is term limited. Her last meeting will be on Oct. 15. Ingrid Ault has served as vice chair for PAC since Oct. 16, 2012, and chairs the commission’s downtown park subcommittee. Julie Grand, outgoing chair of the Ann Arbor park advisory commission, holds up a blank ballot prior to the Sept. 17 officer elections. Ault was the only nominee for chair. PAC’s bylaws require that officer elections be conducted by secret ballot, even if there are no competing nominations. The ballots were passed to Colin Smith, the city’s manager of parks and recreation, for tabulation. Ault was unanimously elected, and will lead her first meeting as PAC chair on Oct. 15. Graydon Krapohl, who joined PAC in January of 2013, was the only nominee for vice chair. He was also elected unanimously. In announcing the results, Smith joked that the spelling of Krapohl’s name showed some variations. PAC’s chair is responsible for nominating the chair of the commission’s budget and finance committee. Grand nominated the current committee chair, Bob Galardi. This did not require a secret ballot, and his re-election took place with a unanimous voice vote. There were several opportunities for communications from staff or commissioners during the Aug. 20 meeting. Here are some highlights. Colin Smith, the city’s manager of parks and recreation, gave several brief updates. He noted that the skatepark construction is well underway at the northwest corner of Veterans Memorial Park. The concrete will be poured soon, he reported. Wally Hollyday, the skatepark designer, is basically living in town for the next few weeks to oversee the project, Smith said. Roof construction at the Mack pool and Vets ice arena is wrapping up – a project that’s perhaps less exciting than the skatepark, he noted, but very necessary. The Vets ice arena recently opened, and indoor ice skating has started. In other construction projects, the playground at Esch Park is completed, and phase two of the Gallup renovations has begun. The hope is that the Gallup work will be finished in November. Smith also highlighted the city’s season-ending dog swim at Buhr Park pool. In 2012, 163 dogs “took their humans to that event,” he joked. This year, there were 419 dogs. He attributed the increase to outreach that staff had done to elevate the event’s profile. 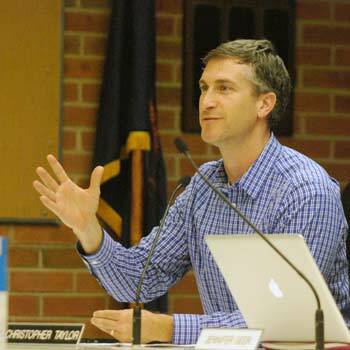 Tim Berla gave a report from the recreation advisory commission (RAC), on which he serves. The group advises Ann Arbor Rec & Ed, a unit of the Ann Arbor Public Schools. He said they’re working on a coach recognition program, to develop a Rec & Ed coaching hall of fame. He also reported that AAPS trustee Glenn Nelson attended the RAC meeting to talk about the sinking fund millage renewal that’s on the Nov. 5, 2013 ballot. Berla described it as not a tax increase, but a continuation of funding to put money into the local schools, to pay for infrastructure needs. He hoped everyone would support it. Shall the Public Schools of the City of Ann Arbor, County of Washtenaw, Michigan, be authorized to levy 1.00 mill ($1.00 per $1,000 of taxable valuation) to create a sinking fund for the purpose of the construction or repair of school buildings and the improvement and development of sites and, to the extent permitted by law, for other purposes, including, but not limited to, the acquisition and installation of furnishings and equipment, by increasing the limitation on the amount of taxes which may be imposed on taxable property in the School District for a period of five (5) years, being the years 2015 to 2019, inclusive? It is estimated that 1.00 mill ($1.00 per $1,000 of taxable valuation) would raise approximately $7,450,000 in the first year that it is levied. 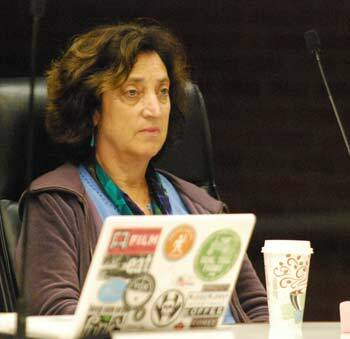 Karen Levin gave a brief update on work of the dog park subcommittee. Survey results are posted online, with about 1,500 responses. [.pdf of 306-page survey results] [.xls file of survey results] Two public meetings are being held – on Sept. 11 and Sept. 24. The subcommittee is still gathering information, Levin said, both on possible locations for a more centralized dog park, as well as how to improve the city’s two existing dog parks. The subcommittee is addressing three questions, Ault said: (1) Is there a need or desire for additional public space in the downtown or near downtown? (2) If yes, then what space would people like to see as an additional public space, and how would they like to use it? and (3) How does the city fund it? 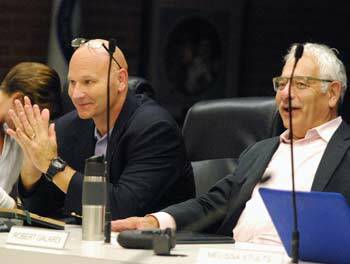 Ault hopes to report back to PAC at its Oct. 15 meeting with recommendations. The goal is to forward recommendations to city council for its first meeting in November, she said. In response to a query from Tim Berla, PAC chair Julie Grand said she expects the two committees will bring forward recommendations in the form of resolutions for commissioners to consider and vote on. Present: Ingrid Ault, Tim Berla, Bob Galardi, Julie Grand, Alan Jackson, Graydon Krapohl, Karen Levin, Missy Stults, and councilmembers Mike Anglin and Christopher Taylor (ex-officio members). Also Colin Smith, city parks and recreation manager. Park commissioners need to be reminded that the city does have a policy about the release of public information; it’s the city’s FOIA policy, which provides for release of public records in most cases except where specifically proscribed by the Michigan FOIA laws. There’s nothing in a parks survey that would trigger any exemptions from FOIA disclosure, except perhaps redactions of phone numbers and email addresses that the city routinely does in the name of personal privacy.